What are Kachina Dolls? A Kachina doll is a carved, painted, costumed doll made by Southwest Native Americans, primarily the Hopi tribe. The dolls are dressed in the costume of a particular Hopi spirit and the dolls are usually presented to a child as a gift. The purpose of the dolls are to teach children to identify the various spiritual figures depicted by the costumes of dolls and the symbolism of their regalia. "Kachina" is a Hopi term that means a variety of things and can refer to spirits, dancers and carved dolls - refer to Kachinas for additional information. Kachinas are powerful spirits of deities, natural elements or animals who can use their magical powers for the good and well-being of the people, bringing rainfall, healing, fertility, or protection. Each of the Kachinas hold different powers. Kokopelli is the most famous of all the Kachina spirits. Kachinas are believed to have the same type of relationships as humans and may marry and have children. Kachinas can therefore have brothers, uncles, sisters, aunts and grandmothers. There are more than 400 different types of Kachinas in the Southwest Indian culture and many of these are depicted as Kachina Dolls. The men traditionally make Kachina Dolls and their work is usually conducted in a special sacred building called a Kiva. 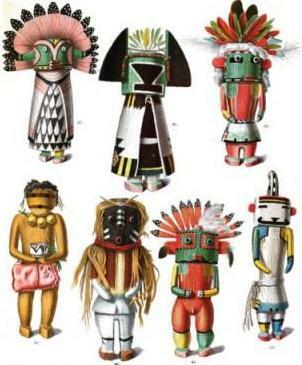 Kachina Dolls are traditionally given during a ceremony such as the Soyal and the Niman. The Kachina dolls are then displayed on the walls of the pueblo where they can remind children of the costume and characteristics of the Kachina spirit.